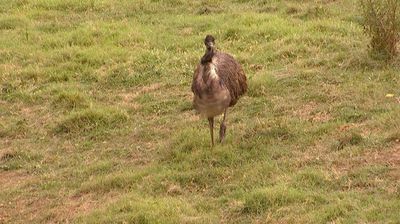 Mike and Frank find themselves in a high-risk situation when they are chased by a crazy emu who roams a farm in Tennessee that the boys are picking. Once they've escaped from the bird they manage to rescue a much sought after fireplace fa ade. Danielle sends the guys to Frank Wolfe, who gives them a golden lead to a guy called Jerry Lotz, where Mike buys a Schwinn auto-cycle bike for a $1,000 and Frank leaves with two rare BB guns. The guys finish up their trip by surprising an old friend of Mike's, Ruby Guidara, a famous Nashville set designer. They purchase an old dentist chair from her that Mike thinks would be perfect in a Lady Gaga video, but when they take the chair to an appraiser they hear some surprising information.